The third part of the most successful strategy game in the German speaking region sets sail into a new, three dimensional world. The masterpiece of the city-building and strategy genre is set in the 16th and 17th century, the era of discoveries and maritime trade and the aim is to discover a fantastic world and build breathtaking cities. Create your own fascinating world with ANNO 1701! Become an explorer and dive into the adventure of your life! Set sail, cross the seven seas and explore foreign continents and other cultures. Demonstrate your strategic and trading capabilities and your diplomatic skills. See how your people cheer for you in prosperous times, but do not disappoint them! 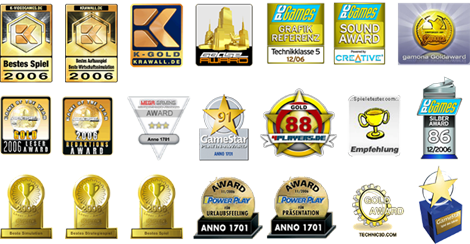 ANNO 1701 is the most elaborate and expensive game production in the German speaking region and the sequel to the most successful, multi-million selling game series of all times. The third part of the unique combination of different genres creates a real-time building game and is also set in 16th and 17th century, the era of discoveries and maritime trade. For the first time, players of all experience levels were included in the development and could help significantly to make the unique gaming experience now even more accessible. The player is engaged in creating, expanding and maintaining a flourishing metropolis, while communicating with other players or interacting with other parties via trade or diplomacy. Become a rich merchant, virtuoso builder or experienced strategist – the open structure of ANNO will reward any individual approach! The fascinating vibrancy of the self-built world, the ever present interaction with the player and an enthralling atmosphere offering excitement and fun will grip everyone who ever played ANNO 1701 forever. Unique combination of city-building strategy, trade, discovery, diplomacy and battle. Maximum interaction with the game environment through numerous event details, such as cheering or protesting of the people, lovingly animated and composed characters, and through trade and diplomacy with foreign people. Extremely detailed and vivid graphics with innovative effects and breathtaking realism in flora and fauna, in the city or in occurring natural disasters, such as tornados, volcanic eruptions or earthquakes. Perfect introduction, even for the less experienced player, for example with the unique ‘Info mode’ and a simplified, clearly structured user interface. Excitement without fail in over 100 different voluntary special tasks (Sub-Quests), which are dynamically integrated into the game and provide useful rewards. Secret diplomacy with special tasks such as sabotage, espionage or demagogy allow for an intelligent, strategic approach. Multi-player mode for up to 4 players via LAN or internet and the option of cooperative play. Military element with troop formation and feedback in spectacular land and sea battles. For multi player games, one DVD per PC is required. For two or more players, 1 GB RAM required. © 2011 Ubisoft Entertainment. All Rights Reserved. Anno 2070, Ubisoft and the Ubisoft logo are trademarks of Ubisoft Entertainment in the US and/or other countries. Produced by Blue Byte. Developed by Related Designs. Blue Byte and the Blue Byte logo are trademarks of Red Storm Entertainment in the US and/or other countries. 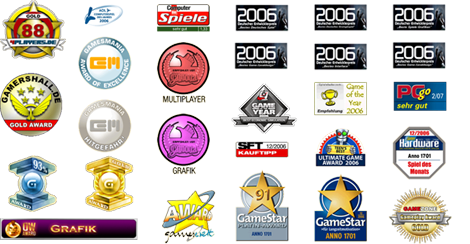 Red Storm Entertainment InC. is a Ubisoft Entertainment company. Uses Bink Video. Copyright © 1997-2011 by RAD Game Tools, Inc.